Large clusters of snowy white blossoms with rich red eyes. 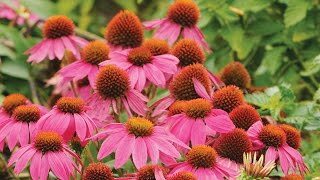 Easy to grow, with a naturally dwarf habit and excellent disease resistance. Eye-catching are the large clusters of snowy white blossoms with rich red eyes. When planted in masses, their sweet fragrance can reach from a distance. Remove spent blooms to promote reblooming. Space plants to provide good air circulation. Take a garden tour and see favorite perennial plants in a garden setting. 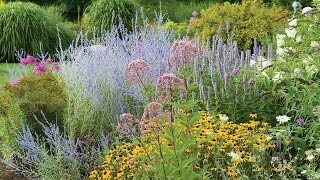 In this video- Shasta Daisy, Ornamental Grass, Butterfly Bush, Echinacea and Hydrangea. Select a location in full sun with a well amended soil that is evenly moist. Make sure there is good air circulation. Dig a hole deep and wide enough to accommodate the bare root. Set the plant such that the crown is at or just slightly below the ground level. Allow roots to fan out from the crown at around a 45 degree angle. Roots should spread out separately, like stretched fingers, from the crown, and not bunch up. It may be helpful to build a cone-shaped mound of soil in the bottom of the hole and spread the roots around it. It is important to set the roots such that the crown is roughly level with the ground. Cover the roots with soil and tamp down firmly to get rid of air pockets. Fill the soil to just below the crown, where the top growth and leaves will emerge. Make sure all the roots under the crown are in good contact with the soil. Water well to fully saturate the roots and soil. Wait until new growth starts to appear before applying a layer of mulch. Divide in spring every three to four years to avoid overcrowding. Plants may need staking; stake entire plant up to the flowers. To control height, delay bloom and increase the number of blooms, pinch plants back by ½ of their height in late spring/early summer. Avoid overhead watering and divide clumps before plants get overly crowded. Plants are intolerant of dry spells. Harvest phlox flowers when 1/3-1/2 of the flowers in the panicles are open. Phlox, Flame® White Eye PPAF is rated 5.0 out of 5 by 1. Rated 5 out of 5 by TamiM from Beautiful! You won't be disappointed with this phlox. The flowers are so beautiful with the contrasting light and dark pink colors. Easy to maintain.